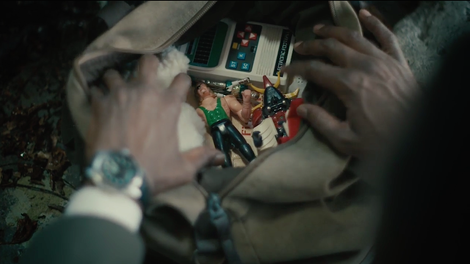 In “The Big Never,” True Detective trots out a whole new bag of toys to distract and tantalize the audience. While the task force’s uniforms tramp heavily over the crime scene, Wayne Hays hunts signs of the kids’ trail alone, walking with measured steps, and his care is rewarded. He finds Will’s missing D&D dice, then a grubby tote crammed with toys. Finally, with quiet but clear horror, he spots a cluster of rocks with Will’s blood and hair still sticking to them. It’s a big break, or it should be, in both the case and the story. So is Hays’ discovery of the Purcell’s baby book (prominently titled Precious Memories), where a photo from Will’s first communion shows his hands folded as they were in death. If we didn’t know that was a meaningful clue, Mahershala Ali’s quiet intensity as he gazes down at it would tell us. But that’s all True Detective is telling us so far. There are clues, and they are big. We can’t know what they mean, even to the detectives, because the writers don’t want us to. This season is designed to fascinate and frustrate, with the dialogue throwing out clues and hints, not facts or even intuitions. The most overt of these hints is the two-part premiere’s mentions of “what happened to Julie and her father” in 1990. The event hasn’t been revealed, though the characters (at the 1990 deposition, at the 2015 filming, and Wayne Hays himself) know about it. That’s not a mystery. That’s willful narrative obstruction. At first it was playful. Now it’s edging on tedious. True Detective’s third season is characterized by omissions. Maybe by season’s end, the show will have earned the trust that intentional blanks demand. But it hasn’t yet. Three episodes in, True Detective’s nominal mystery is dragging. The Purcell children are ciphers, not characters. Their disappearance is a prop to hold up a greater mystery, a mystery of the human heart and head. But the kids need to matter or nothing matters. And the kids don’t seem to matter much on True Detective. Not yet. They’re not the only ones. “The Big Never” is full of characters made into ghosts. Lucy Purcell looms still and pale in a mirror, peering in as Det. Hays searches her daughter’s room again. Lagging behind her dad at Walmart, little Becca Hays (Kennedi Lynn Butler) flutters in and out of sight, her face obscured, foreshadowing the brief disappearance that strikes fear into her father’s heart. And, of course, the closest thing to a real ghost: the late Amelia Hays, her voice honeyed and ominous, appearing behind her widower as he sits at his desk, a revolver inches away. Of these three characters, Amelia is the most present and the most fleshed-out, but here she’s used as an instrument of Wayne’s mind, existing to speak terrible truths. Sitting behind him in the dim room, the memory (or vision) of Amelia pontificates: “Einstein said past, present, and future are all a stubbornly persistent illusion. And are you waking up to that illusion? Now, while things fall apart? Are you starting to see them clearly?” There are question marks at the ends of those sentences, but they aren’t questions, not really. Wayne Hays quakes with mortal terror, and maybe something beyond mere mortality. It’s not only that his case—his last case—is falling apart, that a cover-up is falling apart, that his memory is falling apart. For Wayne Hays, everything is falling apart, and falling together. His memory is churning itself into a mass of confusion. “Please, not like this,” he pleads. “Whatever’s happening, I don’t deserve this.” Amelia agrees. No one deserves this. True Detective withholds evidence, and so did Wayne Hays. But he’s withheld more than professional secrets. He withheld himself from his wife, from their children. And just as he can’t change the choices of a past investigation, he can’t change the ways he let life pass while he fretted over cases. Over a case. He can’t change how that case changed the course of his life. The case is interwoven in his life, sparking his marriage, then seemingly destroying it, stealing his focus from his own children. As Amelia says of Robert Penn Warren’s Tell Me A Story, the story and the self are inseparable. True Detective’s reluctance to let us into its secrets is purposeful, mimicking Wayne’s history and his predicament. He’s withheld so many things so long that finally he struggles to reveal them even to himself. My quibble isn’t with the story’s structure, the intentional omissions and the way characters talk around the facts. It’s with the story’s graceless handling of that structure, its failure to provide anything substantive while we wait, and with the show’s descent into self-parody while it sits on its secrets. It sounds silly, almost prim, to say that this outing of True Detective—a show built on murder, missing persons, and staged corpses—is too violent. The show’s harshness is one of its hallmarks. But this season, it’s hard to know whether the violence is driving the story or coming along for the ride. Hays and West dragging a suspect out for a violent interrogation, a gang of neighbors ambushing Brett Woodard (Michael Greyeyes): These scenes are crammed into the action with crass abruptness. As gut-churning as they are, they’re empty compared to the emotional pain unfolding in other scenes. When Amelia swaggers in fresh from interviewing the Sallisaw cops, her husband shames her for her glow of investigative triumph. In “Kiss Tomorrow Goodbye,” young Henry (Isaiah C. Morgan) beams as he tells his dad of a triumph, and Wayne hears not a word of it. It’s small. And it’s the most important thing in life. Maybe the violence, emotional and physical, is necessary to create the oases of mundane peace with which True Detective occasionally surprises us. In “The Big Never,” one such moment comes from Roland West’s visit to Tom Purcell. Light spilling into his kitchen shows the bereft father now sober, quiet, and reflective. Even West, a fidgety firecracker in 1980, radiates subdued calm in 1990. He’s the one who hauled Purcell “out of that hole” five years back; he’s the rugged lieutenant who takes his former partner’s put-downs in stride. The performances are quietly contemplative, patient, profound. The story isn’t. It’s teasing us along with small revelations that mean nothing so far. A bag of toys hidden in the rocks. A set of D&D dice scattered on the cold autumn ground. A tantalizing hint of secrets willfully withheld by the very detective charged with exposing secrets. We’re not Elisa (Sarah Gadon), a documentarian with all the facts spread out before us. We’re not the deposition lawyers, skeptically poking into a known past. And we’re not the Purcell kids, ready to be tempted by a cheap bag of tricks. There are mysteries, and then there’s trickery. Mysteries can be profound, unsettling, revelatory. Trickery is shallow. Like Wayne Hays, tormented by fragments of his own memory and the haunting sense that there is something more, something dreadful, looming behind those scattered pieces, we don’t deserve this. “This is like Afro Hart To Hart?” I would watch Carmen Ejogo and Mahershala Ali solve silly mysteries in swanky ’80s style for a decade, and again in syndication. 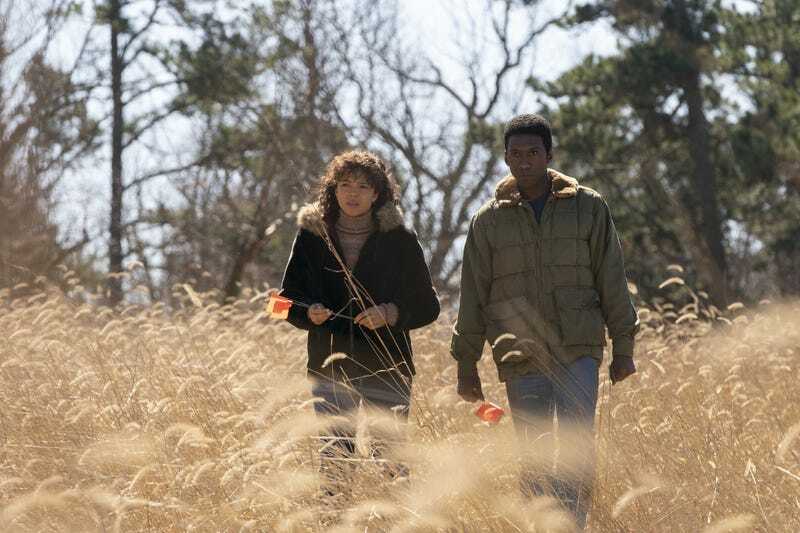 Even before they start dating, True Detective shows Amelia Reardon and Wayne Hays walking along, half-flirting and half-fighting, their hands full of red (okay, orange) flags. I’d put money on the long duffle that Brett Woodard handles so gingerly being anything but Julie’s body, probably a shotgun or other weapon he plans to carry in case of future ambushes. After the heart-stopping fear of losing his daughter, and the inseparable way the Purcell case still gnaws at him, Wayne’s lecture to his wife makes perfect psychological sense. But it’s also an indictment of pop-culture preoccupation with true crime stories, an appetite for pulp and real-life potboilers that’s only grown in the years True Detective has been on the back burner.